Sarah Jane was the oldest member of the William and Lovina Morgan Family. She was born 21 June 1879 at Leamington, Millard county, Utah, the daughter of John Holden and Sarah Lovina Ross. 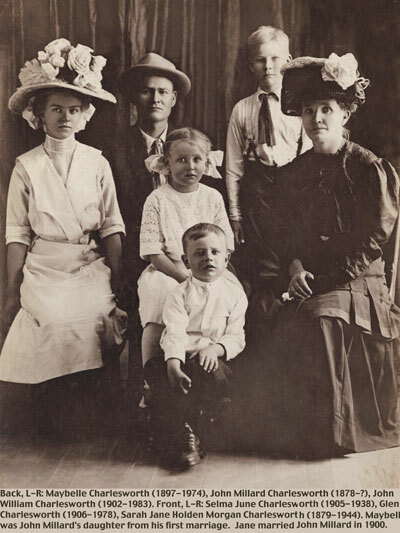 However, she was sealed to William Morgan 15 June 1891 in the Logan, Utah, temple along with her half brothers George, William, Clifton, and sisters Julia Ann, Ada Melissa, and Clara. She was thirteen at the time she was sealed. It is said that her biological father, John Holden, was poisoned in a bar the day she was born. Her mother being fourteen at the time she married John Holden. Her step father was William Thomas Morgan. In his history he tells how Sarah Lovina's mother came to him in a dream and said her daughter Sarah Lovina needed him and they were married 15 Feb 1880. Jane, as she was always called, said her mother seemed more like a sister than her mother because she was so young. Jane is listed in the 1880 census of Millard, Utah, as being with Sarah Lovina and William Morgan. They moved to Neeleyville (A rural area near American Falls), Oneida county, Idaho in the fall of 1881 with her uncles Ted and Jim Morgan, Ted's son in law Willard Moore, and her grandfather Melvin Ross and his family. They arrived late at night and camped on the bank of Warm Creek. The next morning there was a foot of snow on the ground. They called a meeting and decided to make dugouts for their families. About a month after they got there Jane had a new brother who was named George William Morgan. He was born 24 Dec 1881. It was a hard winter. The families gathered iron from massacre rocks and during the winter they went to the railroad camp and gathered potato peelings for seed. A railroad bridge was being built and the men were employed by the railroad to haul lumber. Janes's father (William) had left Leamington with twenty-eight head of cattle and had only one left when spring came. Jim (William's younger brother James John) lost one child, Ted (William's older brother Edward) lost two children, and Willard (Willard Moore, Ted's son in law) lost one. They all died of Diptheria, which was called putrid throat. There was no lumber to make coffins so they pulled a wagon box out of the river. Their burial clothes were made mostly of sheets. One time they were notified by a Mr. Campbell that the Indians were coming. They said they would kill all the white people between American Falls and Raft River and also Rock Creek. Jane's father hid in the dugout and his wife and babies in the fireplace. The cowboys fought them off and they did not come down. The Indians would sometimes come and sit on the door stop until they gave them something to eat. While they lived in the dugouts sometimes the cowboys would come by and shoot at them. People would joke and say there's no use dodging as the bullets have already gone by. Jane went to school at Rockland where her teacher was Teancum William Heward, who taught at Rockland between 1888 and 1892. A log schoolhouse was erected and on 28 Oct 1883 the saints of Neeley (formerly called Warm Creek) were organized as a ward in honor of Wm Neeley who was chosen as bishop. 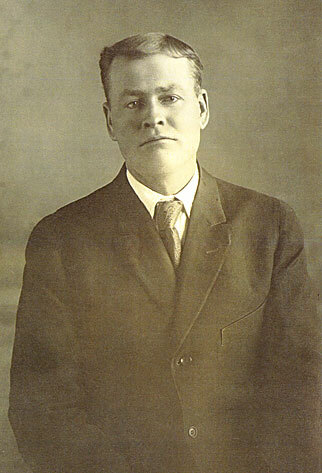 William Morgan was a counselor for 19 years. In 1888 Neeley became a part of the Malad Stake but in 1898 was transferred to the Pocatello Stake. In 1918 the ward organization was discontinued and all the members were transferred to American Falls Stake. Sarah Jane was married 6 April 1901 at the age of twenty-two to John Millard Charlesworth. He was living in Rockland and she was living in American Falls. They had fourteen visitors and Jane's parents to their marriage. She was married by William Neeley. John had been married before and had a daughter Maybell. They lived in Neeley for two or three years where John raised hay and grain. He had held ground in Rockland which they sold and took up a homestead on Sunbeam. They got their homestead the twenty-eighth of May 1914, signed by Woodrow Wilson. They worked hard on the homestead and soon had a log home to live in and buildings to shelter the animals against the harsh Idaho winters. Summer and spare days were spent hauling wood to keep the house warm during the winter. Jack told of how his mother would carry a lantern and lead the horses at night so they could continue to plant the crops. Jane and John made trips to Colorado to visit his parents. They brought John's daughter Maybell back with them to live. John and Jane's children were all born at Neeley. John William (Jack) was born 10 Sept 1902. Selma (June) was born 9 June 1905. Glen (Chick) was born 13 Sept 1906. Florence was born 31 July 1910. Lyle was born 29 Dec 1912. Wayne was born 15 Oct 1914. Florence died of pneumonia 6 January 1911. William Morgan and John went into American falls to get supplies. John was hit by a train and threw fourty feet. It cut all the toes but the big one off one foot. They put him on a train and sent him to Salt Lake. William gave him first aid and administered to him before he left. He was in Salt Lake for some time, which really made a change in Jane's life as he wasn't the same after his accident. Jane was expecting Wayne in October but John disappeared in April because of getting in trouble with the law. John told Jane he would send for her and the children but was never heard from again, leaving a big load on the family. One of Jane's brothers and a friend came to help harvest the crops. They rented the farm out and Jane moved to Neeley where she lived for two years. Jane moved to Ririe and bought a farm, which she lost, and she moved to Rexburg and then, in 1925, to Idaho Falls, where she worked at the seed house. Jack tells about how one time when he and Chick and his uncle Al Morgan crossed the Snake River to get a load of drift wood to burn. On the way back the horses couldn't pull the load and drowned. We all got to shore but I was afraid for my brother Chick as he was much younger than I. In the spring we went back and took the harnesses off the horses and got the running gear, but the box and the wood went downstream. On October 17, 1944, Sarah Jane was living in an apartment on Broadway over Wally's Grocery in Idaho Falls. She went downstairs to the grocery and came back up the steep flight of stairs to her apartment. She sat down to get her breath and quietly passed away. Her daughter in law found her sitting on the old sofa with a bag of groceries on her lap. Click on the link above to see pictures of what life was like on the Charlesworth homestead at Sunbeam, Idaho.